"G-man", but Gareld works for me. When the other pets are asleep he takes out all his comics some snacks, and his t.v. remote. His favorite show to watch is "Who is Next" which is a show where brave neopets challenge Grarrg in a fight. He loves television thats why his favorite game is Adver-Video. He always listens except when taking a shower, brushing his teeth, and eating things that don't have the word "bug" in it. His excuse: "Grarrls in Tyrannia take baths with mud. Grarrls teeth in Tyrannia smell like dung. Grarrls in Tyrannia don't have grilled veggie bowls." Sometimes that pet can be a handful. Everything about he is good. He is very caring. When we are at Neopia Central he always wants to feed a Kadoatie, but we just can't afford it. He is quite handsome, but he still thinks that girls are as yucky as dung. 391 days old and proud to be the oldest. He needs to understand that the older he gets the more responsibility he has. He likes to collect sand. Once he gets alot he puts them in the cooking pot to see what kind of strange sand he gets. His strength is only 13 and he thinks that he's the king of the plateau. All of my other neopets admire him. He shows them tricks, games, and sometimes he even reads them his comic books, but that's on a good day! Everyone who has met gareld agrees that he is a nice and kind grarrl. He always tries to act tough, but the fact is that he can never hide the wonderful neopet underneath. Everybody even he knows that. Gareld140 has a great mind and he always uses it wisely. He makes the best out of any situation. He loves to make people laugh. 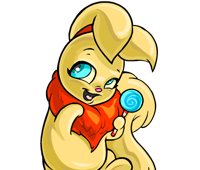 I think that he is a dream pet for any owner in neopia and I am very lucky to have him as my pet. You may think that this is not a story, but it is because this is the story of a perfect pet.